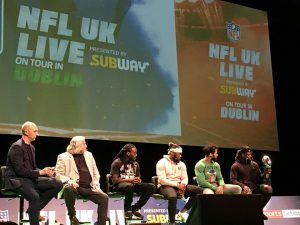 Last Saturday NFLUK Live came to Dublin for 1 night in the Convention Centre . Taking part in the event were Earl Thomas, Jay Ajayi, Landon Collins, Alex Collins and Rob Ryan: while it was presented by Neil Reynolds from Sky Sports. I decided that instead of attending as a reporter/photographer, that I would attend as a fan, in order to have an authentic experience to review. I arrived about 2 hours before the event and took my place as number 1 in the queue. A steady stream of people arrived in a variety of NFL jerseys to make quite a long queue by the time that the doors opened. As the doors opened, it became clear that the organisation in the venue was not going to be very good. Anyone with a backpack was sent to a different queue inside and made to check their bag into the cloakroom for a fee of 2 euro. This resulted in them losing their place in the queue (which was very unfair), and then after climbing the escalator for several floors you were greeted with a Subway wheel that you could spin to win a free gift (tshirt or foam hand). Most people stepped past the wheel to go and get their seats, however upon reaching the door, the security said that they wouldn’t be opening the doors yet, and sent everyone away to wait, or to try and win on the wheel. This led to a lot of confusion as a queue eventually formed, but was not in the order from outside: it also emerged that there was another door, and people were being let in from both sides. To me this was very unorganized, as people who were at the head of the queue didn’t necessarily get the seat that they deserved. Upon entering the theater, I took a seat in the 5th row and waited for it to start. After a little while the event began, and after a short introduction from Neil Reynolds (with some jokes that weren’t overly well received), he proceeded to introduce the guests. Each of them entered individually from the back of the theater, and the first laugh of the night came when Alex walked down the middle aisle, only to realize there was no way up to the stage from there, and he had to go back. When all of the players had entered, the event kicked into full gear, with the players playing games with members of the audience and answering questions, in between looking at some videos.Some of the highlights were a TD celebration challenge where the winner danced the macarena, a challenge to throw a football in a bucket, which was won by an excellent throw from one of the kids, and a whisper challenge where we got to see Earl Thomas’s competitive side. However, the real highlight of the night was when Alex Collins started to Irish dance and was joined by the other players and the some Irish dancers. Overall it was a really fun night where we got to hear from some of the best players in the game and have lots of fun with them. The players were fantastic, as they were very chatty and charismatic, and seemed to really enjoy interacting with the fans. They also stayed on stage at the end to sign items for the fans and take a few photo’s. If there was one improvement that could be made (apart from the organisation) I would say that it was in the presenting. I felt that Neil Reynolds did a poor job at presenting for an Irish audience. Even though he was in Ireland, he was still very much UK focused, and never once asked the players how they were enjoying Ireland, or if they would like to play a game here in the future. He even asked the audience how many have season tickets for the UK games, to which about 2 people put their hands up. He was also very bad at selecting the people to ask questions: he asked alot of people towards the back and upstairs (people who came late) and not many towards the front, which resulted in some jeering and booing, to which one fan said “We queued early, they came late, it’s unfair”. It might have been a good idea to hand the microphone to each player and let them pick people and answer the questions themselves. Overall the experience was a good one, with lots of fun to be had and it is a great opportunity to see NFL players up close. Hopefully they will bring it back again next year, and hopefully we will see an NFL game in Ireland soon.